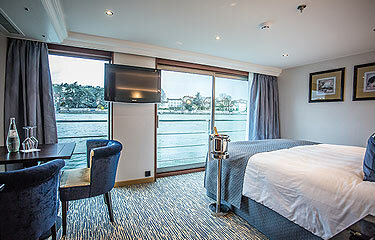 ARE THE CATEGORY 6 STATEROOMS ON TAUCK REALLY THAT NICE AFTER THE REDESIGN? Q – We are thinking about booking a Category 6 stateroom with Tauck on a France itinerary. We understand the cabins have been redesigned somehow and we are wondering if they are improved enough to make them a sound choice/investment. I look at investment carefully and want to see what I am getting for my money, as you can well understand. Should we invest in Tauck? A – Sorry – Tauck is a family-owned company. They are not publicly listed. That means your “investment” would be in renting one of their cruise staterooms. The fact is that Tauck is one of the very top-tier lines. You might want to peek at our reviews. As a rule we recommend that you never make any major travel choices based primarily on cost. If you do, you will be sharing an island that floats with folks who were also buying on price. It will be a floating Dollar Store. The bed is now turned toward the water. There are fewer on-board guests – 98 instead of 118. That can make a big difference. Nespresso coffee machine and refrigerator. More contemporary furnishings in neutral tones.